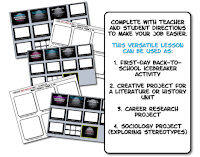 It's even more important during this time of year, though, to offer engaging assignments they want to do. Yet, it's hard coming up with new ideas. Instead of trying to create them all yourself, just get to know your students. Last year when my students were fixated with websites like High School Memes, I decided to utilize that obsession with a meme assignment: create a meme related to the chapter we just read. I expanded the activity when I posted my "Meme Activity..." in my teacher store, which includes a presentation on what memes are, an icebreaker meme assignment, and a mini-research project about memes. 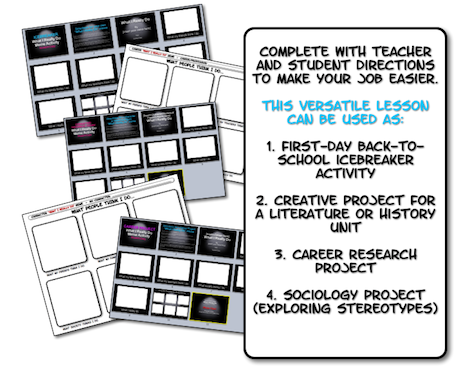 It's a versatile bundle that any content teacher can utilize in class. 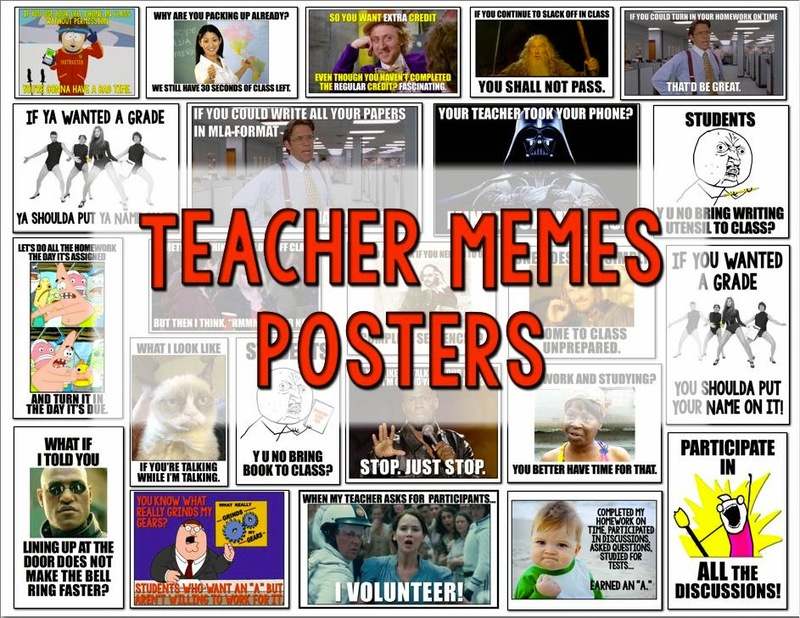 I also have a full set of classroom posters teachers can download with popular memes I created. 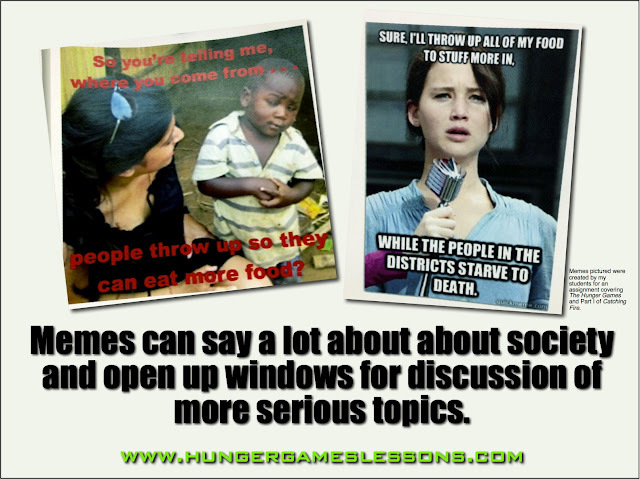 Check them out here: Teacher memes for classroom display or presentations. 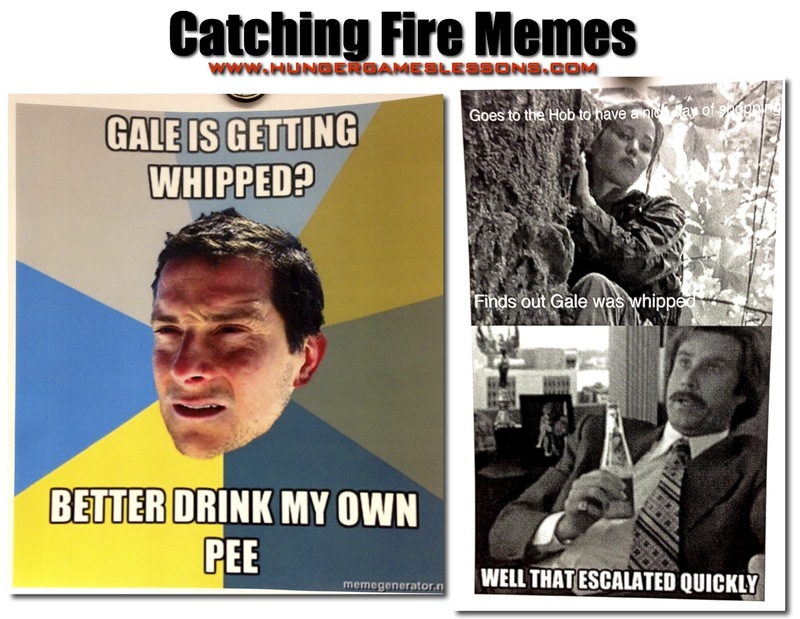 Recently, my seniors made some memes based on Part I of Catching Fire. Some made additional memes for The Hunger Games, and some--who have read the entire series--were excited to create memes for the rest of Catching Fire and Mockingjay. I won't post those yet, but I do want to warn you if you haven't read Catching Fire: spoilers ahead! • Students re-reading the text to find something they can parody or reference. • Students asking one another questions, such as, "Which character said...?" and "Didn't this event take place at...?" and "Why didn't you use this picture? 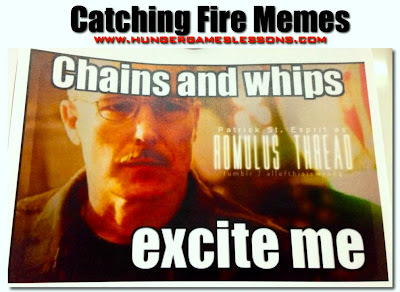 Doesn't it go better with that scene?" 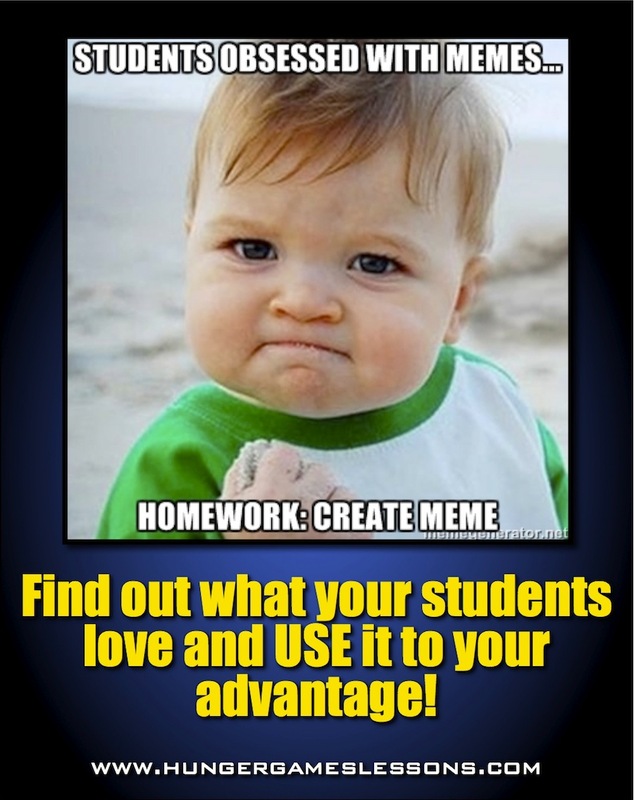 • Students using technology to create the actual meme (some used meme generators online, while others found images and used programs on their MacBooks to add their own text, such as Adobe Photoshop, Adobe Fireworks, or Pages). • Students critiquing one another's finished product and offering suggestions, even explaining and justifying their choices. Not only do they allow students to engage in critical analysis of each other's work, they also offer opportunities for deeper class discussions. 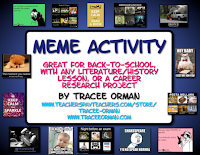 Memes mimic real life; touchy topics are exposed, opening up your classroom to complex conversations you may have otherwise skipped. 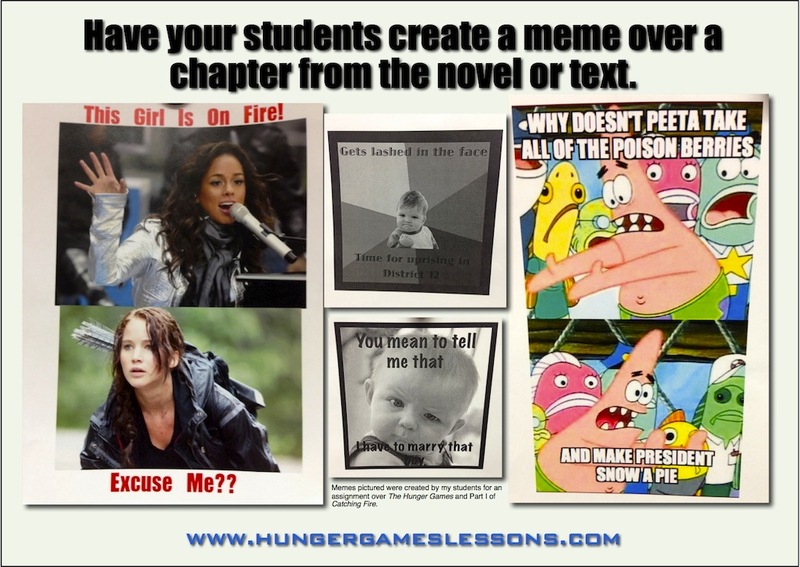 Do you use memes in class? Comment below and see my Facebook page for more conversation about using memes in class. 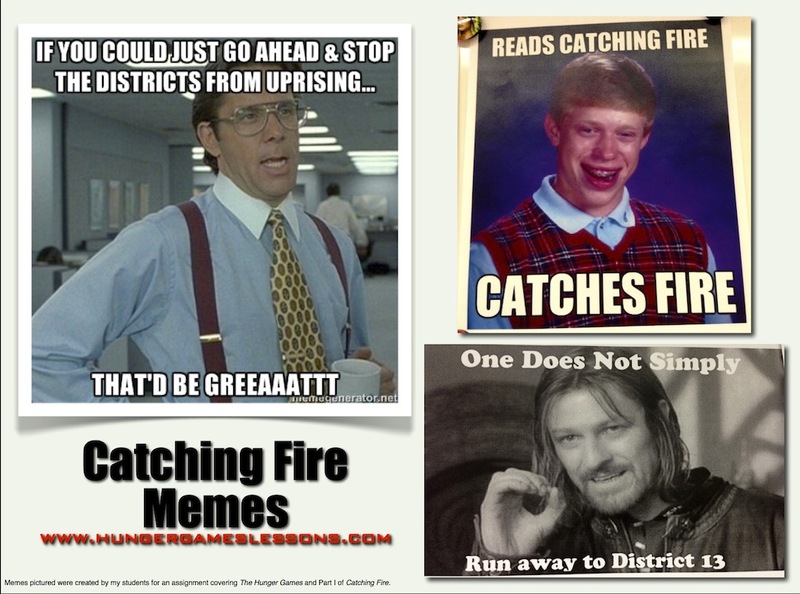 And one last thing: not all of the memes students turn in will be school-appropriate, no matter how many warnings you give them. For some students, they honestly don't realize where they crossed the line. For others, they are just testing the waters. I let them state their justification for using it and ask if there would have been a better way to say the same thing without losing the point. Some students made great arguments; others, not so much. But I believe in giving them the opportunity to be responsible rather than eliminate the activity all together. Here are a few that were questionable for various reasons. (Keep in mind these were made by 17, 18, and 19-year old students, so I'm more accepting of things that I wouldn't allow in my other classes.) Frankly, they still made me laugh! What a great activity idea! 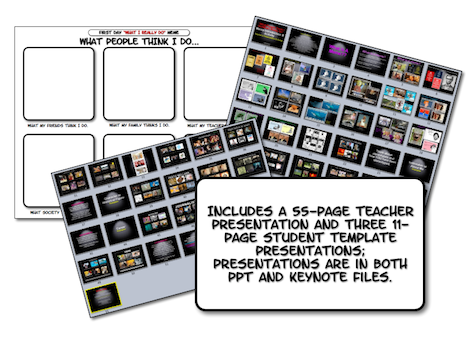 Takes advantage of popular concepts students already know while relating it to literature and the common core standards! Awesome.